Thanks to the wildly successful Comic-Con in San Diego, comic and pop culture conventions have been popping up and growing all over the country. Though commonly known for entertainment panels and celebrity access, at their core, these conventions are a trade show for collectors of entertainment memorabilia. Whether you’re in the market for a top-graded comic book, a vintage action figure, a trading card set, or an authentic piece of movie history, comic book conventions are a great place to grow your collection and track down those hard to find pieces. 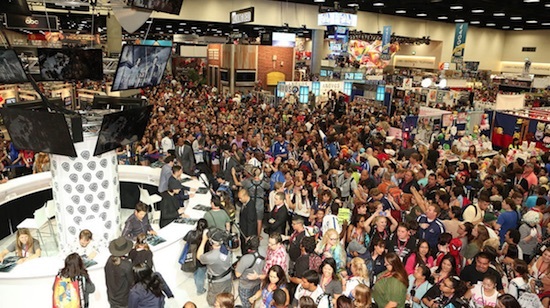 This guide will help you to navigate the floor of your next comic-con. Once considered “nerd culture,” the areas covered by the average comic convention have spread far beyond the pages of your favorite DC or Marvel book. With big budget superhero movies bringing in hundreds of millions, if not billions, of dollars on a regular basis and the television airwaves being flooded by comic book properties, the market has never been bigger for collectibles related to the most beloved characters in pop culture. So, how do you use a comic book convention to find the awesome pieces your collection needs? Every convention will have a main floor with vendors, artists, and promotional teams. Some of these booths will be selling original, one-of-a-kind artwork alongside vintage collectibles, and others will be giving away free trinkets to promote upcoming releases. The best thing an eager collector can do is to be well acquainted with the main floor before spending any money. Try to visit every booth, even those not related to your collection, and get a good look at what they’re selling. 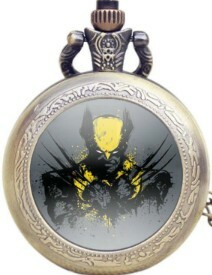 A booth selling steampunk-style pocket watches may be of little interest to you until, upon closer inspection, you discover that they have a steampunk Wolverine watch that you absolutely must own. However, don’t purchase anything on your first walk of the floor and take mental (or physical) notes of all the booths you want to shop at on your second pass. Let’s say you’re in the market for a Kenner Batman Action Figure after reading our guide to collecting Batman. You’re likely to spot several of them at most comic book conventions in varying conditions. Some will be graded, some will just be in a box, some will be loose, and some will be commemorative repackages from the 1990s. When it comes to purchasing items such as this, pay attention to the prices. If you find the Kenner Batman figure in a pristine box for $5, it’s probably not an original. In that same mindset, if you find a loose figure for $200, it may be a bit overpriced. The best thing to do is reference a collector's guide, like the one you're reading right here at Cardboard Connection, and scan for prices. If the guide shows the current active auctions of that figure averaging $95, that should probably be your base price. If you can’t find it for the average amount or cheaper, it is probably better to buy it online. There are generally good deals to be had at conventions but there are also incredible markups that prey on the impulse nostalgia associated with some of these products and a wary eye is crucial to the success of your collection. Further, when it comes time to purchase, don’t be afraid to haggle. If you find that action figure that you greatly desire but it’s priced a little bit higher than you wish to pay, ask for a lower amount. The worst they can say is no, and if they are willing to negotiate, it saves you a few bucks to spend elsewhere. This is where scanning the floor becomes crucial. If you see the same action figure in better condition for a similar price at another booth, mention that. It’s as simple as that. If they say no to your offer, you can still purchase the figure or you can walk away and spend the extra $5 for the better figure. Another tactic is to simply ask the lowest price they will accept for a certain item. This works best if you have more than one item to buy because it allows them to take a few dollars off under the condition that you buy both. Always remember that they are there to sell their products and things like action figures, trading cards, and comic books are only worth what collectors are willing to pay. That being said, don’t lie to the vendor and don’t lowball. If you know the figure is going for $95 at auction, don’t bother offering them $20. They also know the current prices. Keep things civil and realistic and be prepared for a no, but you can never be sure how things will play out and it doesn't hurt to ask. Often times, the booths at comic book conventions are a hair smaller than the amount of merchandise they are selling should require. Because of this spatial limitation, it may take a little digging to find exactly what you want. 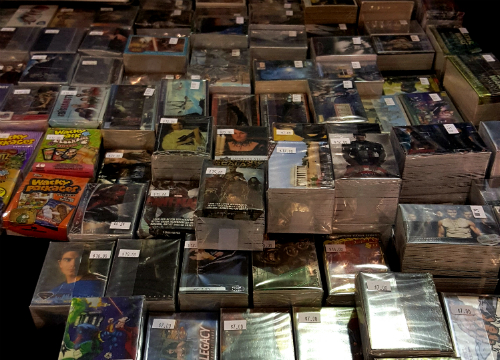 The picture above shows a convention table of entertainment trading cards. There is little rhyme or reason to this display, even less after it has been picked at by thousands of people, so you have to take a few minutes and go over every row. If you’re looking for a Spider-Man set from the 1990s, it may be mixed in between a dozen Star Trek sets, so be prepared to do a little excavating. Trading cards and comic books are hastily displayed in most instances. Comic books may be alphabetical but also separated by their era or by price point so never assume that every Hulk comic book the vendor is selling is simply going to be found in the designated spot. If you’re a serious collector with some money to spend, you should always ask if the vendor has any other issues behind the counter. If you’re looking for vintage Hulk and all you see is modern age Hulk on display, the vendor may be hiding the good stuff for the serious collectors. Always inquire further, get a business card, and start a dialog with the vendors, especially if you’re looking for specific items. Every comic book convention will have an “Artists Row” with booths of unique and original art pieces by independent artists. If there is an artist that particularly strikes your fancy, don’t wait too long to buy their piece. As independent artists, they usually have a much more limited stock and a popular artist may sell out of certain items before the convention is over. Except for online, it is unlikely that you’ll ever see these pieces anywhere other than a comic-con and they often are incredibly unique and original interpretations of beloved characters. 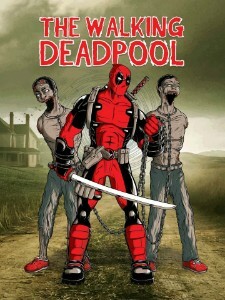 This is where you’ll also find creative mash-ups, such as Star Wars characters dressed as a Doctor Who scene or Deadpool on a Walking Dead cover. Jump on these pieces and don’t bother haggling over price with the artist row vendors as their booths regularly sell out and most have no reason to reduce their listed prices. Aside from being a great place to get autographs or photos with your favorite celebrities, watch sneak peeks of upcoming blockbuster movies, or see some of the most talented cosplay enthusiasts pay homage to many fictional characters, comic book conventions are the ultimate collector’s show. While most collectors think about the buying aspect, it can also be a great place to sell your top collectibles. Anyone with even a passing interest in entertainment collecting, whether it be comic books, trading cards, or action figures, should make it a point to visit the regional convention they’re nearest to and just have a great time shopping in a specialty department store geared specifically to collectors like you! 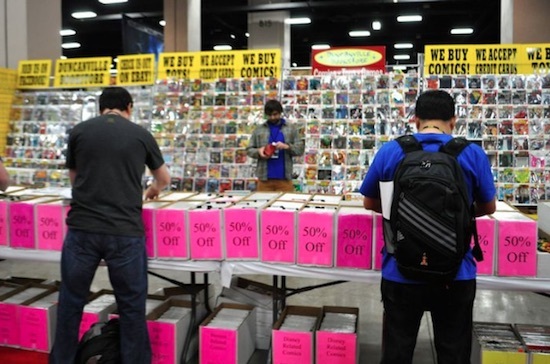 Because collecting comic books is very different than collecting trading cards, there are some things to watch out for when purchasing from comic conventions. We break down the key differences to be aware of, depending on what you are looking to collect. When you see a hand-collated set that you’re interested in purchasing, make sure you check the cards before you leave the booth to be certain you have a complete base set. It is not uncommon that a set is accidentally missing a card or two and tracking down that single card may end up driving the overall price of your set to an irresponsible level. Also, make sure you ask if the prepackaged sets are simply base sets or if they include any chase sets. If they don’t include chase sets (which they probably won’t), ask if the vendor has complete chase sets for sale and, if they do, see if you can negotiate a price to include those. If they do not, and you absolutely want those chase sets, it is time to really look hard at the price. For example, if the vendor is selling a DC Epic Battles base set for $20 and the chase sets are going to run you another $40 online, the price of your full set is now $60. Swing by this site and see how much a hobby box would cost you and consider the added value of having duplicate cards, chase cards, and an autograph, relic or sketch card that you’re not getting from the convention set. Collecting action figures at a convention can be daunting because so many booths are selling them. Obviously, a graded figure in the original box is going to be worth more than a loose figure or an ungraded figure still in the box but that does not mean it should cost you the equivalent of a down payment on a car. Do your research and know what you’re willing to spend for different condition levels before you get there. If you’re researching via this website and see the item for a price you can support, it might be better to just buy it online as you’re often purchasing from the same people who are selling at conventions. It is also very important that you inspect the packaging very carefully to ensure that you’re not purchasing a rerelease of an older figure. Check for copyright dates that are obviously modern, logos that don’t match the original run (DC is an easy one to spot as their logo has changed dramatically in the past 40 years), and look for any fine print that indicates that it is a reissue. Lastly, check that card back! If you’re looking for a 12-back Han Solo, don’t accidentally buy a 36-back for the same price. The value of your figure collection hinges on the research and knowledge you take into every purchase. Review additional guidelines and basics for action figures in our detailed beginner's guide. Obviously, comic book conventions are a great place to purchase comic books. Prices are typically fair and the vendor is trying to unload inventory. Just like the action figures, look out for reissues and don’t get too excited if you find Action Comics #1 for $20. One of the better values, comic book vendors will sell regularly bundles for story arcs at very reasonable prices. If you’re simply looking for older issues to read, you can obtain them pretty cheaply at comic-cons. However, if you’re an avid collector with considerable money to spend, you’ll also be able to find very rare and valuable comics to purchase. At the 2016 Silicon Valley Comic Con, one vendor had the first issue featuring Spider-Man, which was written about in our Ultimate Spider-Man Guide, graded and for sale right next to “5 for a dollar” comics from the 1990s. Do your research, do some digging, and ask around. Considering the amount of money you’re about to spend, always negotiate a price if it is beyond what you think the book is worth. Friendly Neighborhood Spider-Man #1 NM 9.4+ Stanley "Artgerm" Lau variant cover. Hello Tony, your article is very informative. I have a question for you. I have around 30 Godzilla, and related super hero movie collectibles, mostly small to mid-size action figures. They are in excellent condition, although no original boxes. An auction house in Dallas is interested in reviewing and offering a purchase price. How much can I expect to be paid for these Godzilla and super hero collectibles? Your advice is greatly appreciated.